A Part of My Story!!! Good Morning!!! Happy Monday!! If you know me even a little bit, you know I am a talker. I can talk all day and I have since I was a little girl. We always said if someone kidnapped me as a child, they would bring me back because I wouldn’t stop talking their ear off. I’m a very open person as well. I have no problem sharing the ins and outs of my life even if it’s hard to talk about. Life is hard but it doesn’t mean we don’t talk about it! I love this sentiment for this card because I feel like it fit perfectly for me. The moment someone enters my life in person or online, for a moment or for a longtime, they become part of my story! This is the inside of the card actually. Lately I have been all about decorating the inside with a coordinating image or even putting the greeting on the inside and just a beautiful decoration on the outside. Do you like to decorate the inside of your card? Let me know in the comments below! Of course with this card being Night of Navy, I needed to put a piece on the inside to write on! I used a lot of the Free Sale-A-Bration items for this card. 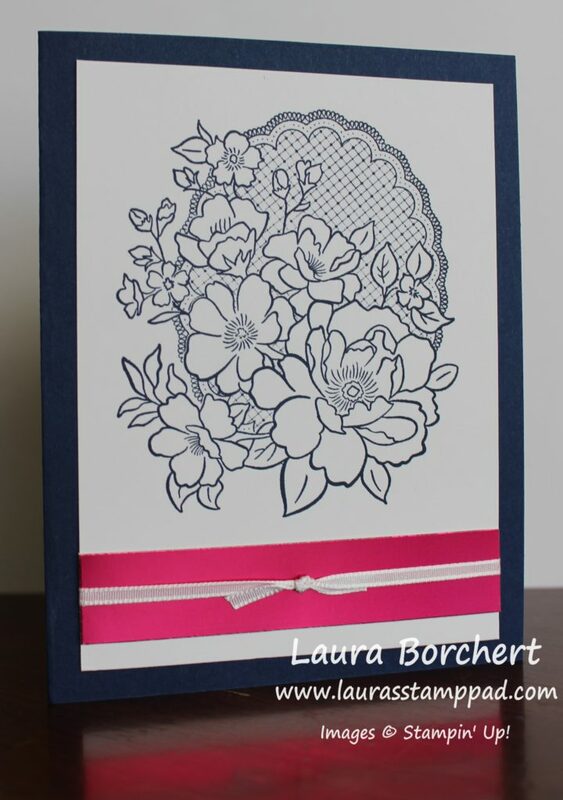 The image on the front and flower on the inside are from the Lovely Lattice Stamp Set. The greeting is from the Part of My Story Stamp Set and the Lovely Lipstick Foil Paper is from the Foil Pack (Lovely Lipstick & Grapefruit Grove). We all love Free Stuff and look at this beautiful card created with it! Each of these items are at the $50 level! I started with a Night of Navy card base. Next, I stamped the image in Night of Navy Ink onto a piece of Whisper White measuring 3-3/4″ x 5″. On the bottom portion, I added a piece of the Lovely Lipstick Foil Paper measuring 3-3/4″ x 3/4″. This foil paper is beyond amazing. It’s just so beautiful!!! Next, I took some Whisper White ribbon and tied it around the white piece over the foil. Then I added this to the card front. 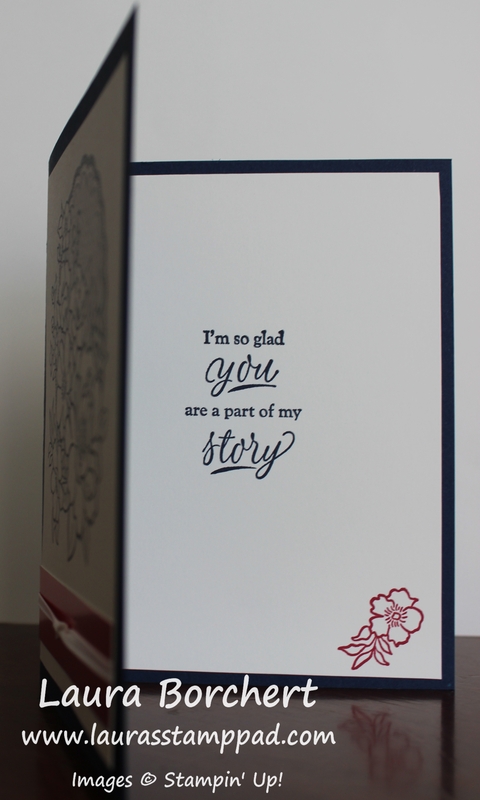 For the inside I stamped the greeting in Night of Navy and the flower in Lovely Lipstick Ink! Simple stamping and quick to assemble! This is another card that any greeting could be stamped on the inside because it is so versatile! What greeting would you use?? Let me know in the comments below! « Laura’s Loyal Stampers Update!!! Very pretty. Yes I like to decorate the inside as well as outside. My free gift this month was the Lovely Lattice stamp set. I just LOVE it. As of yet have not used it but will very soon. I am pretty shy when it comes to meeting new people so a “talker” is nice. lol I love watching your videos.